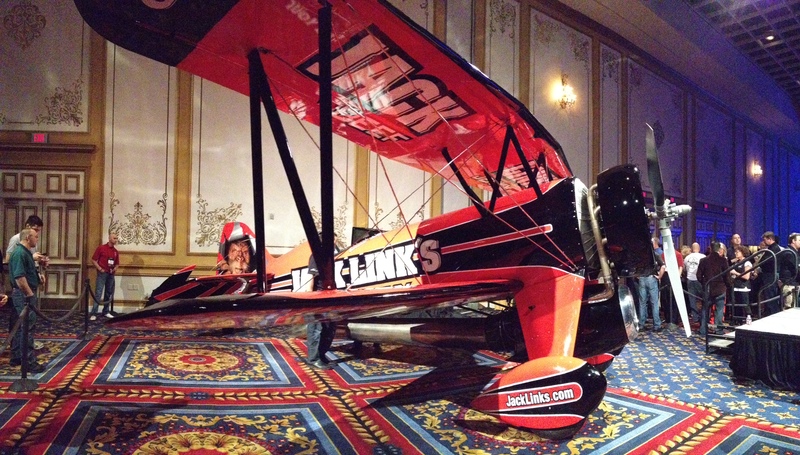 The 2013 International Council of Air Shows (“ICAS”) Convention kicks off this morning after the reception last night here at Paris Las Vegas. Although the US jet teams are back for the 2014 season, both Air Force and Navy TAC Demo support will be substantially reduced or nonexistent in the coming season, depending on the platform that interests you. I’m still working on getting a sense of the pulse of the industry and what reduced military support is going to mean for airsows in the long term if it continues. This morning is the first exhibit hall session and the first chance to really walk around and get a sense of everyone’s feelings about the upcoming season and the longer-term prospects. 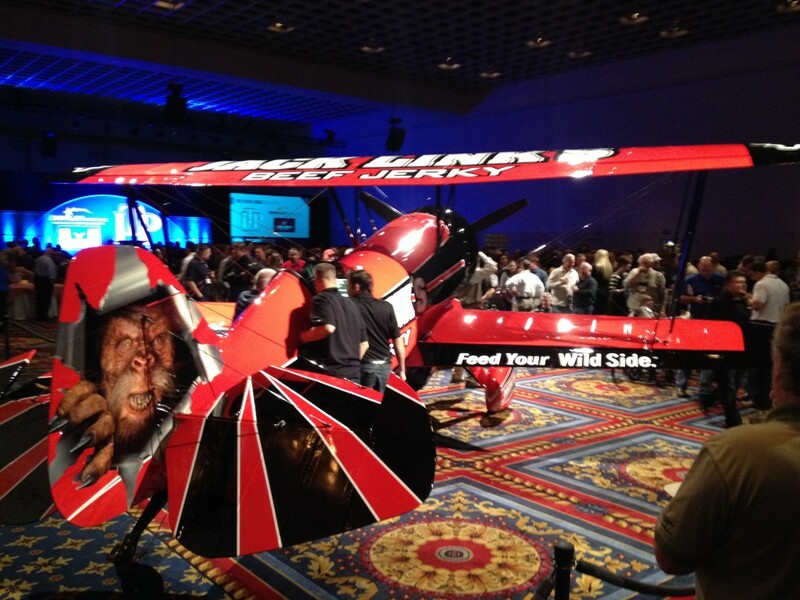 The highlight of the reception was John Klatt’s unveiling of the Screamin’ Sasquatch, a 1929 Taperwing Waco. It has a Pratt & Whitney 985 radial engine on the nose, but the real kicker is the CJ610 (J-85) jet engine mounted on the underside. Jimmy Franklin first flew a jet Waco in 1999. The unveiling here at ICAS featured the Jack Links Sasquatch himself posing for pictures. Perhaps the most important element of the Sasquatch announcement is the fact that Klatt managed to land the sponsorship deal that enabled the ‘Squatch. Sponsorship is critical to many airshow acts, and putting together a jet Waco isn’t something that one can do on appearance fees alone. Klatt is a lieutenant colonel in the Air National Guard, having flown F-16s and C-130s. Through last season, he had flown an MXS in Air Guard livery and he participated heavily in recruiting efforts at each air show that he flew. Klatt’s migration to the new aircraft and a private-sector sponsor might be a harbinger of things to come in the industry as military support is reduced or isn’t as reliable in light of ongoing budget issues and economic conditions. Time will tell, of course. But, in the meantime, it’s a real coup that Klatt has landed what is clearly a major deal that will bring a unique aircraft to the skies of many airshows and get Jack Links and its “wild side” message exposure to airshow and other fans. Major sponsorships like this aren’t an option for every performer. Or even most performers. But Klatt showed us that he could do it and the aircraft is gorgeous. There’s a sponsorship breakout session at the convention and I’m planning to attend it. Sponsorship is by no means the largest moving part in the industry and it’s by no means a new thing. But Klatt’s deal is a ray of light and I’ll be following this and other developments.